Anne Ku’s high school friend Rob Judkins painted his vision of piano and guitar in acryllic for the Bekkers Piano Guitar Duo’s next CD: Live in Makawao, Maui. I have not seen or spoken to my friend Robby Judkins, as he was called then, since our graduation from Kubasaki High School in Okinawa. His Japanese wood cut print “Kokoro Kara” still hangs in my London home, reminding me of his extraordinary talent for creating something beautiful. It was Keats who said “a thing of beauty is a joy forever.” Everyone who has visited or stayed in that Victorian Cottage in Ealing has seen and experienced the beauty that Robby created. “Kokoro kara” means from the heart. When one creates from the heart, one shares what one feels. I have often wondered about the Japanese wood block print. What were the two figures looking at? What was Robby’s inspiration? Many years later, I found Robby on Facebook as Rob Judkins. Glancing through his photo album, I saw that he has continued to paint with a clear development into his own style. I was relieved to see this, for I had heard of too many adults who gave up pursuing their childhood hobby or passion. I nearly did, only to return to music to find myself again. In doing so, I also remembered my dream to be free to travel the world. I daresay that I am extremely privileged to be on Rob Judkin’s private mailing list — as a recipient of his latest works of art by e-mail. His latest work is a colourful vision of piano and guitar. Although Rob Judkins has not heard or seen us perform, he has imagined it well. Our music is very exciting –as though the strings fly off the guitar and keys pop out the piano. We always get an adrenaline rush when we play. The painting is 32″x48″ acrylic on boxed panel. 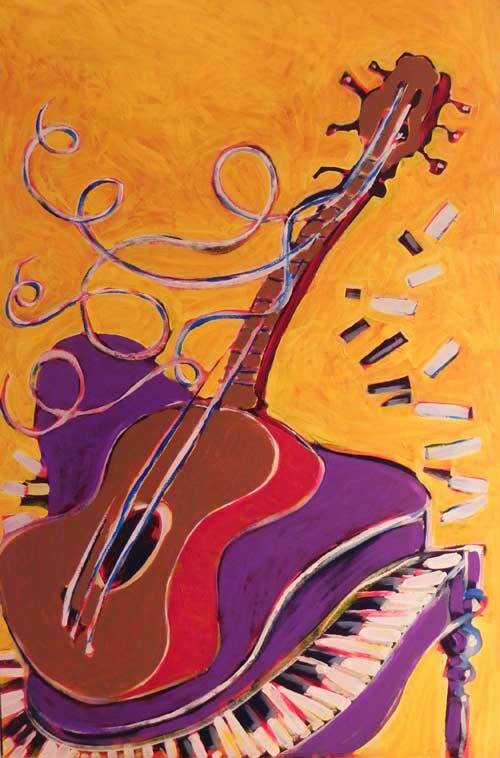 Rob Judkins calls it “Anne’s instruments” since it was painted specifically for the Bekkers Piano Guitar Duo and the purpose of an album cover. It will be on the cover of our next CD: Makawao Live — a recording of our first public concert in the USA — at the Makawao Union Church in Maui on 29th December 2007. Rob Judkins loves to paint. The majority of his paintings are in acrylics but he has many oils and some water colors. He has a range of sizes from 8″x10″ canvas to pieces as large as a 36″x80″. The majority of his work is hanging at D’Allens Salon and the Columbus Hospice, in Columbus, GA and some pieces at the Joseph House Art Gallery in Columbus, GA. Rob spent a year and a half at Auburn University School of Arts but changed his career to the school of business. His passion for the arts still drives him to create and achieve interest and quality in his work. He spent his high school years in Okinawa, Japan taking Chinese painting and Japanese wood block printing classes. That influence can be seen in some of his work. Rob likes a wide variety of styles in painting. He will strive to paint a realistic landscape or an abstract painting. He says it doesn’t matter what the results as long as it speaks to someone or provokes a feeling in the individual viewer he has accomplished his purpose. Godd advoice . thanks for sharing with us . Piano music is one of the most familiar musical instruments.